Meet the cutest cartoon you have ever seen - Molang and his best friend, Piu Piu. It is a lighthearted and silly cartoon TV series that are great for young kids. It is geared towards young kids but my oldest daughter and I were watching it with my youngest daughter. What I have gathered is that Molang originated from Korea. A university student, Hye-ji Yoon, created Molang back in 2010. I have read that the main character design was based on a Korean Sticky Rice. That makes sense because his body does look like a cooked fluffy grain of rice. The character design does reminds me of Pusheen the cat. My oldest daughter thinks it is one of Hello Kitty's friends. At the time, Hye-ji Yoon's six year old cousin, suggested to name the character Malang which means squeezy and soft in Korean. So she took that idea and changed it to "Molang". Originally, she didn't give Molang a gender but now she changed it to a male character. There is no dialog in the TV show. Not one word. They are not speaking a different language. Just cute little noises to mimic that they are talking. It is like TV shows: Pingu Penguin, Naya's Arctic Adventures, and Shawn the Sheep. Don't worry, you can easily follow along the story. 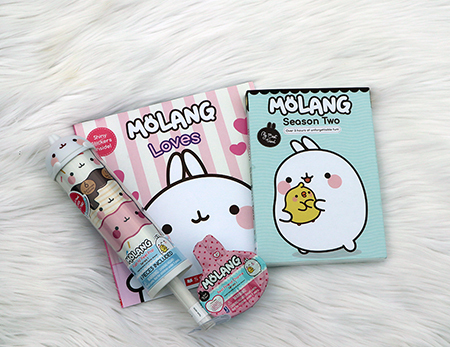 Just watching a few episode of Molang can make you fall in love with the character. The Season Two DVD has over 3 hours of Molang and Piu Piu silly adventures. Each adventures/episode is under 4 mins long. It is a 2D simple animation instead of the usual CG ones. 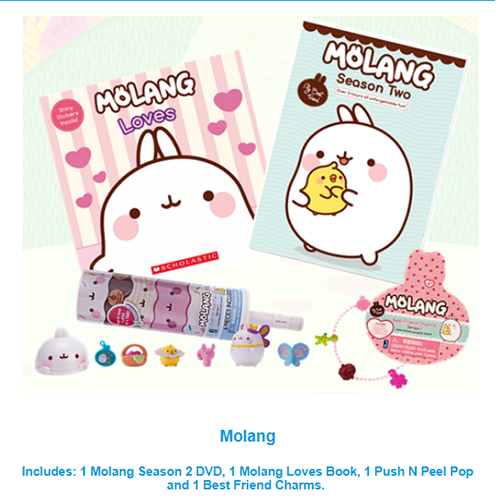 Just watching Molang can bring smiles to your little ones. Even the intro song is a happy catchy simple tune that I could hear my youngest daughter humming to it. Join Molang, a round, fluffy, and happy rabbit, and his friend, Piu Piu, a poised, timid, and reserved yellow chick, as they explore everyday life. This giveaway will run from April 12th to May 10th, 2018 (midnight EST). Winner, You have 72 hours to reply. You must be 18+ Open to Canadians and U.S. only Good Luck! Psst - Can't win if you don't answer the mandatory question. I am not responsible for shipping and handling or damages of the prize. The prize is shipped by the Sponsor and they may substitute the prize depending what is in stock. Hi,I am from Newfoundland and another I think the kids would like to watch from NCircle Entertainment is Mack & Moxy: S.T.E.M. Strong. I live in NB. My boys would enjoy Super Mario World: The Complete Series. I do love these graphics, they are simplicity itself but still manage to express what's needed. I am from Manitoba and would love Super Mario World: The Complete Series. I'm in Ontario, I would like Guess How Much I Love You: One More Tickle! I live in NB and would love to watch the new Guess How Much I Love You: One More Tickle with my kids! I am from Alberta and another DVD I would love to watch is The Cat in the Hat Knows a Lot About Camping! I'm in BC and I would love to also watch Super Mario World: Complete Series.